Photo by Mandel Ngan/AFT via Getty Images. WeWork views profitability like I view running the Boston Marathon: An admirable goal that just isn't happening anytime soon. Or possibly ever. The co-working giant yesterday reported a $1.9 billion net loss on $1.8 billion in revenue for 2018, representing year-over-year increases of 103% and 105%, respectively. 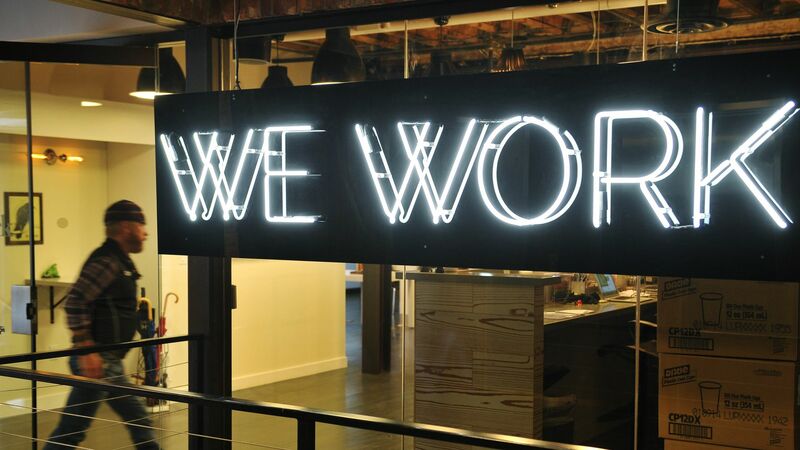 WeWork president and CFO Artie Minson acknowledges that both figures are expected to keep growing, as the company continues to construct new facilities and sign new long-term tenant contracts. But he also thinks that I'm paying too much attention to the net loss figure, harkening back to his prior CFO role with Time Warner Cable: "It took decades for cable companies to show profits, but that doesn't mean they weren't creating lots of value." This is an argument that all of the money-bleeding unicorns, including Lyft and Uber, will make to public market investors. They'll also note how they've got plenty of cash on hand thanks to private equity. Don't forget Warren Buffett's old line about airlines: "If a farsighted capitalist had been present at Kitty Hawk, he would have done his successors a huge favor by shooting Orville down." In other words, it's possible to create a successful disruptor without creating a sustainable company. Not saying that will be WeWork's fate, or Lyft's for that matter, but I'm also not, not saying that. • Moving on: More than a dozen venture lending bankers have left Square 1 Bank to form a new practice at Signature Bank, Axios has learned. The final number could top 20, some of whom spent more than a decade at Square 1. It includes professionals in multiple locations, including San Francisco, Denver, Raleigh-Durham and Chicago. Signature Bank hasn't yet made an announcement, but two of the bankers say the appeal was being able to launch something brand new. Neither had bad words for Square 1 Bank, which was acquired in 2015 by PacWest and which will retain plenty of venture lending professionals. • Nameplate: Private equity firm J.W. Childs Associates has changed its name to Prospect Hill Growth Partners, about a month after founder John Childs was busted in the Florida massage parlor prostitution sting. This is yet another example of why investment firms shouldn't name themselves after founders. Following Childs' arrest, the firm said that he "is not currently active in management of the firm," even though he was listed as an "executive officer" in an SEC filing from just last November. • Silver lining to iron bars: A London arbitration court has ruled in favor of private equity firm Baring Vostok, over a business dispute that led to the arrest and ongoing detention of Baring Vostok founder Mike Calvey. Here's some background on the commercial conflict, which relates to control of a Russian bank. We also did a Pro Rata Podcast on the situation with Bill Browder, author of "Red Notice" and the driving force behind the global Magnitsky Act. Calvey, a U.S. citizen whose jailers have not allowed him family visitations or even phone calls, last week told Washington, D.C. to steer clear of his predicament, via a local newspaper interview: “I don’t want to politicize this story and try to distance myself from everything that could lead to that." 🎧 Pro Rata Podcast: Our new episode focuses on the Green New Deal, and the lack of specifics from both proponents and opponents. Listen here. McDonald's (NYSE: MCD) agreed to buy Dynamic Yield, an Israeli provider of personalized sales assistant software, for $300 million. Why it's the BFD: It's the fast food giant's biggest acquisition since buying Boston Market in 1999, and will digitally revamp menu ordering screens to incorporate everything from time of day to weather to trending items. • Nancy Boehm (ex-CIT Group) joined Perella Weinberg Partners as a managing director and chief technology officer. as a managing director and its chief technology officer. • Mike Gaviser has joined the new investment firm being set up by former KKR private equity chief Alex Navab. Gaviser was a fundraising-focused managing director for KKR for over five years, before leaving last April.